Duane Evelan remodeled damaged mobile homes and one day in 1971, while he was working, a representative from Bolar American was watching him. The salesman was impressed and eventually asked Duane if he wanted to build trailers for Bolar American. Duane agreed, so along with his brother Gerard Eveland, and sister Gladys Coffland, they made a contract with Bolar where Eveland’s Inc. would build the trailers and Bolar American would market them. In 1972 Bolar went out of business and left Eveland’s Inc. without a marketing company. Duane talked with his brother and sister and they decided that they would market camp trailers; changed the name to Scamp Trailers and started manufacturing and marketing their own trailer. The company was renting an old Ford building, but they still managed to produce 130 trailers by the end of 1972. Over time the Eveland’s needed more space and by 1975 they built their first manufacturing building where the present factory is today. The Scamp 13 foot trailer was the only trailer produced in the early years of the Eveland’s company. It wasn’t until 1978 when the 16 foot Scamp was designed and 3 years later the 19 foot fifth wheel was added to the line. While the 19’ fifth wheel is still Scamp’s only fifth wheel model, over the following years Scamp produced new floorplans and options, striving to make Scamp trailers the best that they can be. In 1983 Duane bought out his sibling’s shares of the company and ran it by himself until his son Kent Eveland took over. Today Kent is currently the president of Scamp Trailers. Scamp trailers are very economical due to the fact that they are lightweight and can be pulled by almost any small vehicle. They are much more maneuverable than larger trailers and much more convenient than tents. They have a parts department that can keep your trailer up and running. 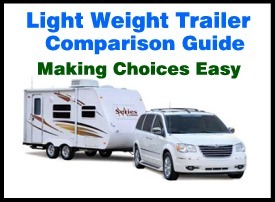 To find out how Scamp Trailers compares to other light weight trailers order our Travel Trailer Comparison Guide. We rate over 60 manufacturers in the industry and you will become an informed buyer after reading our publication. We also share valuable negotiating tips and other resources to help you make an informed buying decision. Order yours today.